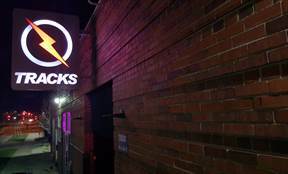 Tracks is Denver's premiere GLBT nightclub. With a name that stretches back for decades, Tracks is deeply rooted within the GLBT community and continues to strive to be the best GLBT Nightclub in the nation. Tracks is more than just a gay bar — it's a veritable multiplex of GLBTQ-centered activities. The decades-old nightclub has it all, from Denver's largest ladies' night (First Fridays) to RuPaul's Drag Racewatching parties to DJs from across the globe rocking its multiple dance floors. The door and bar staff are friendly and efficient, and the sound system keeps every party going, no matter the size of the crowd. From spring-break underwear parties to Pride weekend blowouts, Denver's vibrant GLBTQ community is in the spotlight at Tracks.